What is a cotton candy ice cream cone? Cotton candy ice cream cones (a.k.a. 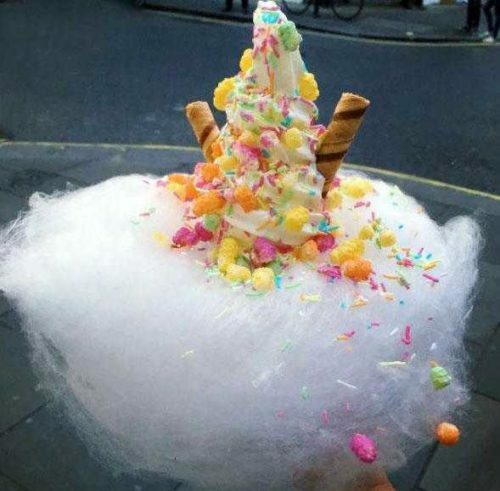 cotton candy-wrapped ice cream, cloudy ice cream, cloud cones, sugar clouds, candy floss ice cream [U.K.] and fairy floss ice cream [Australia]) is simply an ice cream cone wrapped in a fluffy cloud of cotton candy. 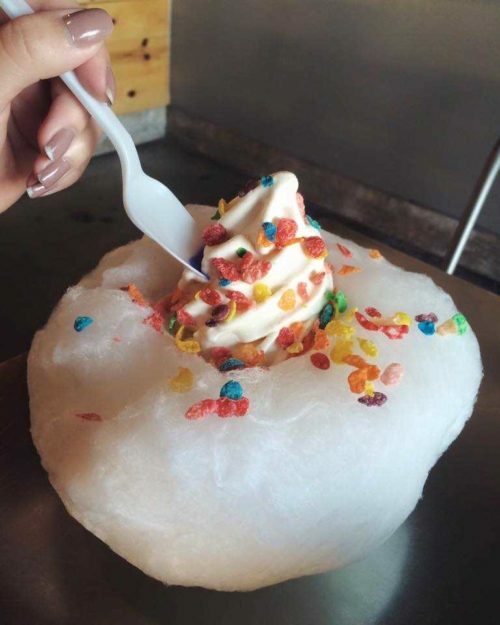 The ice cream is typically soft-serve and is decorated with all kinds of candies and other sweet toppings. 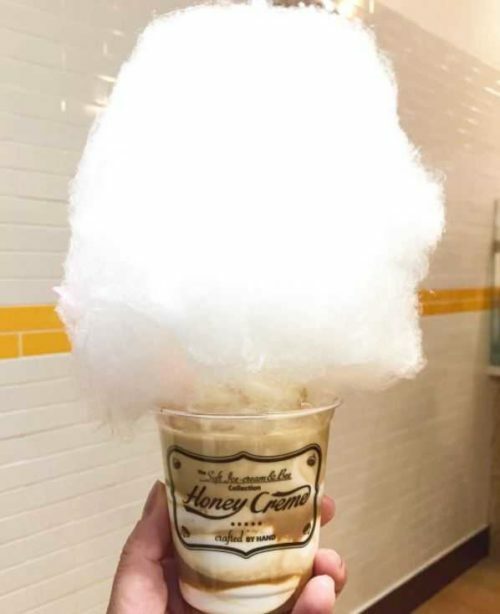 A variation includes ice cream in a cup topped with a decorated cloud of cotton candy. It originated at a place called Milk Train Cafe in London, England and has spread throughout the globe to Dubai, the Philippines and Australia. 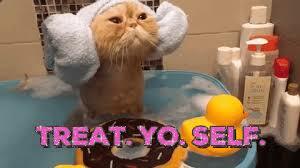 Looking for more places that serve cotton candy ice cream cones? You can find them on Glutto right here. How can I make it? 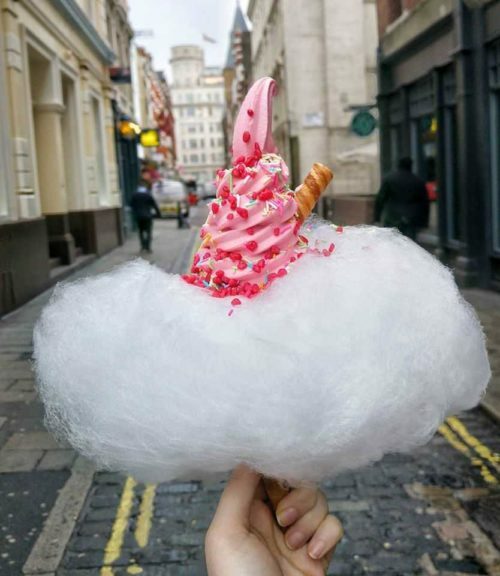 Cotton candy ice cream cones are easy to make as long as you have a cotton candy machine, which you can get quite affordably. Here are the steps to make this eye-catching dessert. First, follow the directions for the cotton candy machine and wait till cotton candy begins to form. 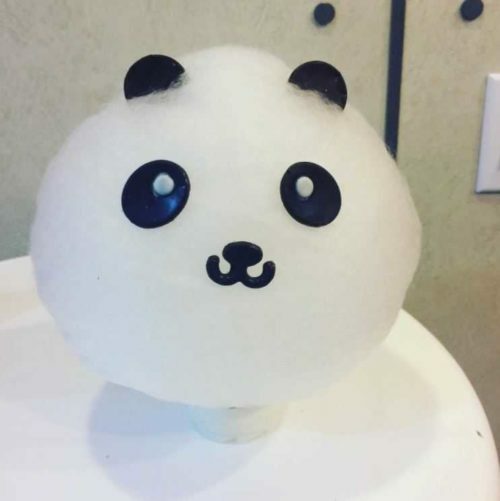 Collect the cotton candy by wrapping it around the top of an ice cream cone so it creates a fluffy cloud shape. Fill the cone with ice cream.